Microsoft Research are usually worth keeping an eye on as they're known for producing some very nifty bits of Windows software and this time their Interactive Visual Media Group has rolled out the Image Composite Editor or ICE to shorten the name a bit. ICE is an advanced panoramic image stitcher and, like most of the amazingly cool stuff that emerges from Microsoft Research, it's free. 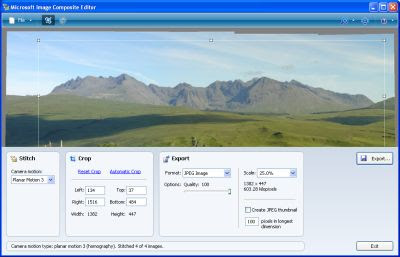 Okay, you can already create panoramic images for free in Windows Live Photo Gallery, and it's very good at it too, but if you're looking for that bit more functionality and control and don't really want to have to shell out for a commercial panorama tool or delve into the free but complex Hugin, then ICE is looking very nice indeed. ICE has state-of-the-art stitching and exposure blending algorithms and allows advanced camera orientation adjustment. It can also output to more formats and with more control over compression levels than Windows Live Photo Gallery but it's still so easy to use. All you need to do is drop in a set of overlapping photographs of a scene from a single location and ICE creates a high-resolution panorama, incorporating all of your images at full resolution. You can choose from several algorithms for camera motion or let it choose automatically. Once the images have been stitched, you can automatically crop off the uneven edges or do it manually to suit your own image preferences. Once you're happy with the stitch and crop, then you can then save your panorama in a wide variety of formats, from common ones like JPEG, PNG, Windows BMP and TIFF to the new-ish HD Photo format and multi-resolution tiled formats like HD View and Silverlight Deep Zoom. You can even choose to scale the exported image if you want to. Versions of ICE are available for both x86 and x64 Windows systems with .NET 2.0 or above. Oosah - Too Good to Be True?